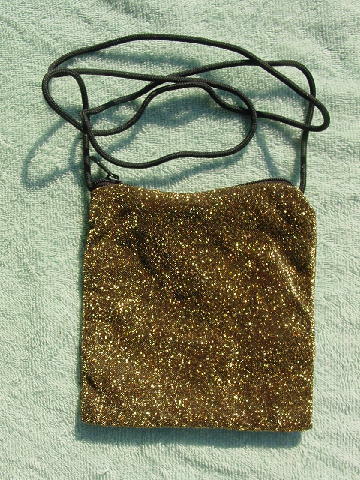 This gold metallic fabric evening purse has a black fabric (probably acetate) lining. It has a top side to side zipper and a 53" long black cord shoulder strap. It's light in weight and was made in Mexico. It sparkles more in person and the color is not as bronzish as it appears in the picture. It's from a Miami model. She sold all her evening purses. Since having a baby, she doesn't go out dancing any more.